and appointing a county manager to implement those policies while managing the operations of the county. The Commission annually adopts the millage rate and approves the county budget, which determines the revenue and expenditures necessary to operate all county departments. 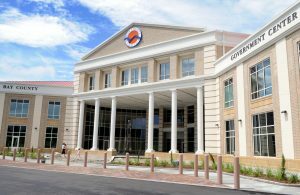 The majority of county government offices are located in the Bay County Government Center. The three-story building provides a single, convenient location for county residents to conduct their business and includes the departments of Planning and Zoning, Information Technology and Geographical Information Systems, Code Enforcement, Builders’ Services, Development Services, Public Works, Traffic Engineering, the Traffic Management Center, Veterans Services, Human Resources, Budget, Risk Management, Purchasing and the County Manager’s Office. All Bay County Commission-governed offices, as well as the Commission Chambers, are located at the 11th Street site with the exception of Emergency Services, Parks and Recreation, Utility Services, the Solid Waste Division, Mosquito Control and Fleet Maintenance. The Center is also home to the offices of the Property Appraiser, Supervisor of Elections, Tax Collector and Division of Motor Vehicles, U.S. Congressman Neal Dunn and State Senator George Gainer. 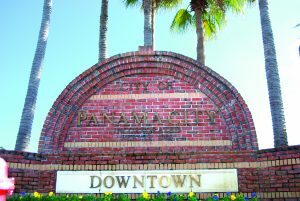 More than 37,500 residents call Panama City home. The largest city between Pensacola and Tallahassee on the Florida Panhandle is located on the shores of St. Andrews Bay. 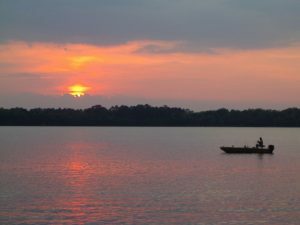 Panama City retains the charm and beauty of a sleepy fishing village, while still enjoying the amenities of a busy metropolis. With more than 200 acres dedicated to leisure activities, Panama City features two walking parks, a large sports complex, a dog park, seven waterfront parks and eight clubhouses available for meetings, parties and family events. With many miles of waterfront, Panama City is a boater’s paradise. Downtown Panama City serves as the area’s art and theater district, anchored by the Martin Theatre and the Marina Civic Center. These venues host varied events ranging from local talent to national touring events and notable acts. Downtown is also home to the Panama City Center for the Arts and several private galleries, including the Paul Brent Gallery. 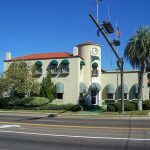 In addition to the Downtown area, Panama City encompasses a number of wonderful neighborhoods each with their own distinct character: Forest Park, Glenwood, the Cove, St. Andrews, and Millville are just a few. Many companies and major employers make their headquarters or major facilities in Panama City, including WestRock, Kraton Chemical, Eastern Shipbuilding, Berg Steel Pipe Corp., Jellyfish Health, and NantHealth to name a few. Panama City is dedicated to educating the next generation of skilled employees through its high-achieving public schools, numerous private schools and charter academies, Gulf Coast State College and Florida State University’s Panama City campus and Troy University’s Panama City campus which are all conveniently located within city limits. The Panama City Community Development Council promotes and markets the city as a destination to tourists and business travelers, as well as bringing about improvements to the area to support these travelers and the community. In addition to its status as the seat of Bay County, Panama City is served by five hospitals, diverse shopping, acclaimed restaurants and the kind of Southern hospitality that makes our city “The Great Place” as well as the best place to live, work and play. The City of Panama City Beach is approximately 19.5 square miles located in Florida’s Great Northwest. The City is home to almost 13,000 permanent residents with over 17 million tourists visiting the area annually. The City is considered the fastest growing of Bay County’s seven cities in both population and area. With a population of young families, seniors and early retirees, Panama City Beach is considered an ideal place for relocation and vacation. Stretching 18 miles along the beautiful waters of the Gulf of Mexico, Panama City Beach’s economy depends heavily on tourism. Tourism in Bay County contributes to around $2.7 billion dollars in economic impact. For every 91 visitors to the area, one full-time job is created. Approximately 20 percent of upland owner shoreline is classified recreational and public use. The remaining publicly accessible beachfront features hotels, condominiums, restaurants, entertainment venues and personal homes. The City’s renourishment project keeps the beaches along the Gulf of Mexico in pristine condition as the area continues to see manageable growth with an industrial park, large Conservation Park and commercial office park, Pier Park, amphitheater, swimming area, walking paths and a large commercial/entertainment area. Community life is supported with three elementary schools, two middle schools, and a high school; various recreational and social areas including parks, Gayle’s Trails, walking paths, swimming areas, senior and youth centers, golf courses and two fishing piers; a branch of the Bay County library; and numerous medical, vision and dental offices. The City is home to worship/gathering groups of various denominations and an abundance of financial institutions. “Lynn Haven is a growing and vibrant family-oriented city with a flourishing economy and pristine environment, where all people are safe, healthy and have equitable opportunities for success and happiness,” said Michael White, City Manager of Lynn Haven. The City continues to grow, offering an abundance of resources to the citizens and business community. Lynn Haven continues to rise with a current population of over 20,000 residents and maintains its identity as family-oriented and business-friendly alike, including a vibrant downtown that preserves and values its local heritage. Lynn Haven citizens are involved, caring, and active. They are engaged in civic and fraternal organizations, such as the American Legion, Rotary, Garden Club, Masonic Lodge, Odd Fellows, and others. They also support Lynn Haven Law Enforcement and serve on a wide range of volunteer boards and committees that help city commissioners make better informed decisions. Residents enjoy the city’s many amenities and events. Sharon Sheffield Park, located in the heart of Lynn Haven, offers a wide range of events for the public. This includes Spring/Fall Concert Series, Trunk-or-Treat, and Winter Wonderland to name a few. The City is working to promote the historic downtown area, and ideas are in the works to host various events in the upcoming year. The City continues to attract many new businesses. Economic development activities include the promotion of the Lynn Haven Commerce Park and the Hugh Nelson Industrial Park. These parks are home to national companies such as General Dynamics, Trane, Merrick Industries and Jensen USA. Redevelopment efforts of its historic downtown area are being emphasized and supported by the Lynn Haven Community Redevelopment Agency. Come visit for a while and stay for a lifetime! Callaway has a “small town” atmosphere with its own shopping district, but is still within driving distance to many beaches and scenic bays. It is conveniently located east of Panama City, near Tyndall Air Force Base. It’s East Bay at its Best! 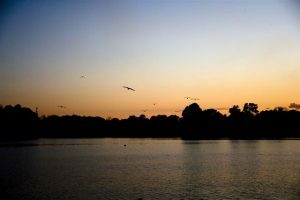 Callaway’s pristine waterways, residential and recreational areas, and the Arts and Conference Center help make it a diverse community. There are many parks with something available for everyone. Some of the park amenities offered include: Veterans Park with a walking path, picnic area, playground, and is pet friendly; John B. Gore Park provides a boat ramp, floating docks, a Community Center with a meeting room and small kitchen, outdoor picnic area, and is conveniently located next to sports practice fields, a playground, and tennis courts; Brittany Woods has a walking park; Patterson and Collinfurst Parks both have beautiful and serene water views with picnic areas. The Arts and Conference Center, located at the Recreation Complex, features an auditorium, meeting rooms and a caterer’s kitchen, which are available for special events. Also located at the Recreational Complex are two t-ball fields, two youth baseball fields, three multi-use ball fields, five soccer fields, a football field, a fully stocked community fishing pond, a mile-long walking trail with exercise equipment and two playgrounds. The Callaway Community Redevelopment Agency (CRA), established in 2007, seeks to revitalize the community and promote economic development. The purpose of the Callaway CRA is to enhance existing neighborhoods and to expand business activities within its main commercial areas. One of the main objectives is to fund new public infrastructure projects needed to accommodate businesses and development. The CRA has grant programs available for existing businesses and commercial property owners, including a façade improvement grant. More information on these CRA grant opportunities can be found on the city’s website. The commercial districts in Callaway offer many services and amenities to citizens and visitors, including many financial services, dining opportunities at the many local diverse restaurants, lodging at its hotels, as well as other new commercial entities. Callaway Elementary School is located within the city limits, and Everitt Middle School and Rutherford High School are in close proximity to the city. Callaway’s City Commission strives to protect the delicate balance between property rights and property values. It has approved legislative requirements, which ensure quality growth within the City of Callaway. 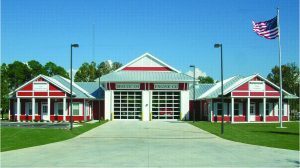 The Public Safety Building houses the City’s Fire Department and a substation of the Bay County Sheriff’s Office. The City has expanded its water and sewer utility services outside of the city limits in order to accommodate new growth and business expansion. Public transportation is available through the Bay Town Trolley, which traverses the entire county. Callaway has a Historical Society that is home to the City’s historical artifacts in a museum located next to the “Old School House” which has been designated as a Florida Heritage Site. Both are located inside John B. Gore Park. We look forward to showing you what the City of Callaway has to offer. The beautiful and quiet City of Parker, known for its gorgeous sunsets, overlooks East Bay and St. Andrew’s Bay. Parker is an incorporated municipality with a five-member city council including an elected mayor. Its landscape has changed dramatically due to Hurricane Michael. Many of the hundred year-old oaks the city is known for are gone, yet there are plans to eventually replant the right kind of trees, ones that will better survive future storms. A small community of just over 4,400 citizens, Parker is nestled between the bays and Martin Lake. Although the City only comprises 2 square miles of land, residents and visitors enjoy 12 miles of shoreline. Its southern boundary is coastal and borders Tyndall Air Force Base. Parker is a neighborhood community with a large sports complex that will be rebuilt, a unique environmental/educational park, two waterfront parks with boat launches and has its own fire/EMS and police departments. Founded as a community in the early 1800’s, the City of Parker celebrated its 50th anniversary as a municipality in 2017. The City is rich with history, being the earliest settled area in the County. If you are looking for a place to fish, water ski or just relax, this is the place. If you love to shop, there are many area stores within driving distance for your convenience. Parker is a great place to come home to! On February 26, 1935, thirty-eight qualified voters met at W.B. Gray’s Hardware and Lumber Company to select officers and organize a new municipal government. After the town officials had been elected, it was necessary to designate the official name of the municipality. There was only one name proposed: Springfield. Springfield has grown into a thriving, mainly residential, city with an up-to-date water and sewer system, City Hall, innovative police and fire departments, a rentable community center, two beautiful walking parks, boat ramp access to Martin Lake, sports field, playground and a sports complex with two baseball fields and a soccer field. Additionally, the City of Springfield has five medical facilities, a state veterans home, three schools, (Springfield Elementary School, Everitt Middle School, Rutherford High School) and Shaw Police and Fire Training area utilized by our departments and other local municipalities. The city is located within 4 miles of Tyndall Air Force Base and borders the east side of Panama City. Over the years, Springfield has maintained its small town appeal and is a great place to live. Springfield’s leadership is proud of the friendly atmosphere and quality of life, and feels confident that as you get to know it better, you will share the same opinion. Welcome to Springfield…”Moving ahead, together”. A small, coastal community located on the western end of the Florida Panhandle’s Forgotten Coast and the eastern end of Bay County, Mexico Beach is approximately 3.5 miles long and 1.4 miles deep. It is currently home to 1,200 permanent residents, comprised primarily of retirees, base personnel from neighboring Tyndall Air Force Base and a number of business owners and their employees. Because of its proximity to the beautiful, emerald green waters of the Gulf of Mexico, its sugar white sands and quiet, non-commercialized setting, the community is a natural pick as a vacation destination for families looking for a getaway to a more traditional, less busy destination. 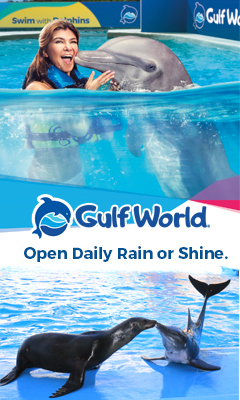 Many families choose to relocate to this area to enjoy the warm, sunny days of “Northwest Florida’s Unforgettable Coast,” where the Southern hospitality is as authentic as the Old Florida charm. Quaint Mexico Beach is situated far enough away from the crowds and congestion, yet strategically close enough to urban amenities such as medical facilities, airports, and libraries. 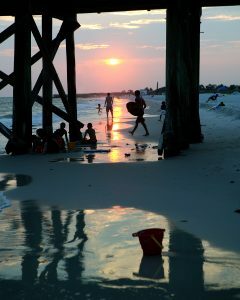 Due to its unique natural and social assets, Mexico Beach’s economy is almost entirely dependent on tourism. The City’s beautiful, pristine beaches are also the safest in the area due to the lack of rip currents, which are prevented by a sand bar that parallels the beach, adding to its attractiveness for those who like water activities. 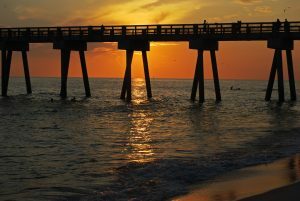 In addition to the beautiful public beaches, the City of Mexico Beach is working on developing a state-of-the art fishing pier that will feature many amenities that fishermen and beachgoers will be able to utilize and enjoy. A three bay public boat ramp on the canal allows boaters direct access to some of the best fishing locations in the Gulf. The City recently completed a canal upgrade which improved seawalls, walkways and boat slips that are available for both short and long term periods. The 3.5 miles of U.S. Highway 98, which run parallel to the Gulf of Mexico, boasts zero traffic lights and a scenic, unobstructed view of the Gulf. While much of Mexico Beach continues to convey a predominant spirit echoing a setting from the fifties and sixties, some change has begun in the community. A number of townhome developments, adhering to the height limitations are emerging where 1960s block style construction once stood. The results are more retirement/relocation living and investment opportunities, as well as additions to the community’s vacation rental inventory. On the near horizon, Mexico Beach anticipates potential expansion to the west end of the city with ongoing communications between city officials and the landowner regarding various development ideas. The proposed area for annexation lies between Mexico Beach and Tyndall AFB. Mexico Beach, with its intrinsic natural beauty, friendly people and dedicated conviction toward managed growth and preservation of natural resources, is a superb community in which to vacation, relocate, or retire.